We all love our outdoor pursuits, but hiking and backpacking can put unique strain on your body. The forward bending posture and, often, prolonged uphill climbing creates stress in the lower back, glutes, and hamstrings. Carrying a pack, even of light weight, puts strain on the upper back, shoulders and neck. Then there’s the usual fatigue in the calves, ankles and arches of the feet that will happen to anyone who is on their feet for long periods of time. There are two basic Yoga Asanas (Poses) that will specifically help stretch and strengthen all of these muscle groups to help reduce the risk of injury. 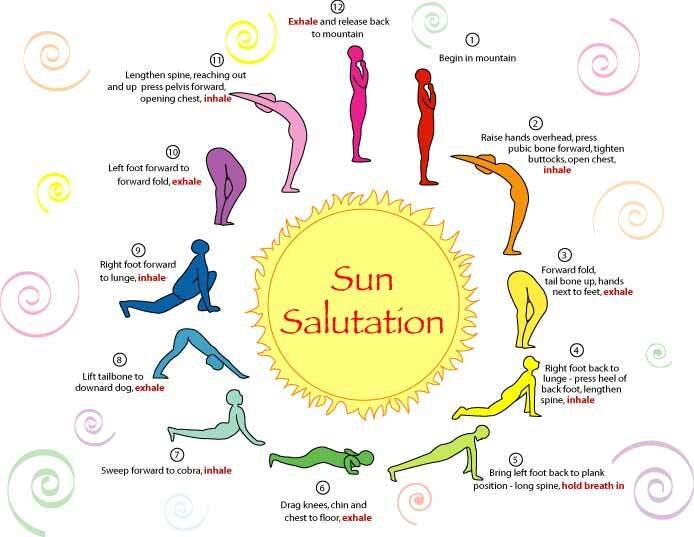 Both asanas are found in the Sun Salutation sequence. If you followed my previous Yoga Practice for Hikers article you are already familiar with the Downward-Facing Dog and the Cobra Pose as they are both an integral part of that sequence. Downward-Facing Dog (Adho Mukha Svanasana) puts focus on strengthening the upper back while also stretching the shoulders, hamstrings, calves, arches and hands. Holding this pose and moving through this pose also work to strengthen the arms and legs. It is also said to be beneficial for digestion and relieves headaches, back ache, insomnia and fatigue. For our purposes, we will be focused on the muscle contraction in the upper back at the apex of the pose, and getting as much of a stretch as is comfortable in the hamstrings, calves and arches while maintaining a tight core. Cobra Pose (Bhujangasana) is used to strengthen the spine and stretch out the chest, lungs, shoulders and abdomen. At the deepest stretch in this pose it will also firm the glutes and stretch your quads. Proper deep breathing in this pose will help to stretch and open the chest. Cobra is supposed to stimulate the digestive organs, help relieve stress and fatigue, sooth the sciatic nerve and be therapeutic for Asthma. We will be focused on keeping shoulders back and chest out, pushing the hips to the floor to strengthen the glutes and get a good stretch in the quads. If you want to add focus to strengthening the arms and wrists, we can replace the Cobra Pose with Upward-Facing Dog (Urdhva Mukha Svanasana). The benefits and muscles affected are similar but the Upward-Facing Dog requires pushing up and forward, with the hands firmly planted, using the arms, shoulders and upper back to hold the position. There is a tendency to “hang” on the shoulders in this pose, which compresses the neck and lowers the chest. Be mindful of your posture here, shoulders should be drawn back toward the tailbone lengthening the neck. Head should be straight, looking forward, or slightly bent back. In pause between breaths, move your left foot back, both knees on the floor (or into Plank Position – THIS IS OUR STARTING POSITION). Exhale and raise your tailbone, straightening your arms and legs, pushing your chest toward your feet and your heals toward the ground (Downward Dog Position). Focus on knitting your shoulder blades together, upper back tight, chest out, shoulders back and arms straight. Keep your neck in line with your torso (spine straight). Feel the full stretch in your glutes, hamstrings, calves and arches. Do NOT force the stretch beyond what is comfortable. The pose should not hurt. You may hold this pose for several breaths if you like, but continue proper, controlled breathing with your core strong. Exhale and slowly lower your chest and nose to within an inch or two of the mat, your hands firmly planted and elbows in close to the body (Chaturanga or Four-Limbed Staff Pose). Your knees may touch the mat if you prefer. You can pause at this position briefly or you can glide through this pose and straight in to Cobra Pose. If you will be moving into Upward-Facing Dog instead of Cobra, keep your legs straight here and do not let your knees touch the floor. Inhale and lower pelvis while pushing the chest up, arms supporting the posture and shoulders back (Cobra Position). Focus on knitting the shoulder blades again with your chest out and shoulders back. Don’t worry about forcing your back to arch uncomfortably, but focus more on keeping your shoulders back, head up, and pushing your hips to the ground. The arch should be held using the back muscles, not by pushing with your arms (unless you are using Forward-Facing Dog here). Feel the stretch in your quads. If you are comfortable with it, roll off the balls of your feet and point your toes. This will move you forward a little and deepen the stretch. 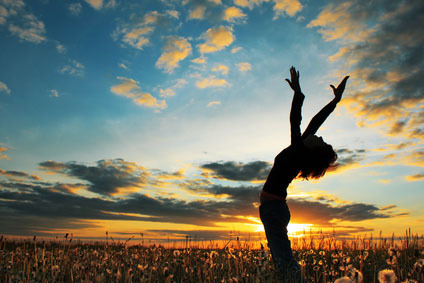 Breathe deeply in this position opening the chest and lungs. Exhale and raise your tailbone, straightening your arms and legs, pushing your chest toward your thighs again and your heals toward the floor returning to Downward Dog Position. Repeat steps 6 through 8. To come out of the exercise, reverse steps 1 through 5 until you are back in Mountain Pose. This sequence is as much a strength training exercise as it is a stretch and I treat it as I would push-ups (Hindu Push-ups). So, for pre-hike stretch I would maybe do 15 or 20 of these to warm up. If your breathing becomes too forced and erratic, you are working too hard…reduce the reps or slow down. Remember to maintain controlled movements, slower is better. You should not be throwing your body into any of these postures, you should move into them naturally. As you practice, the postures will feel more natural and comfortable as your strength and flexibility improve.